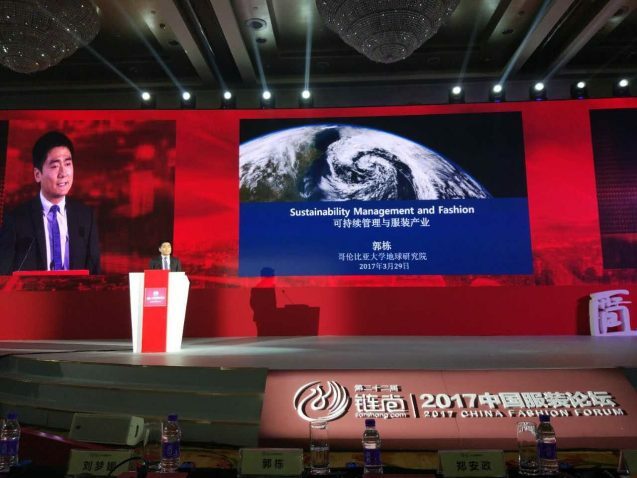 Dong Guo, associate research scholar and the associate director of the Research Program on Sustainability Policy and Management at the Earth Institute, speaks at the annual China Fashion Forum in Beijing on March 29. Major companies have been adopting sustainability concepts and tools to improve management and transform corporate culture. Research has found that sustainability practices within the private sector not only help cut costs, but also strengthen brand loyalty, employee morale and product innovation. Dong Guo, associate research scholar and the associate director of the Research Program on Sustainability Policy and Management at the Earth Institute, and I attended the annual China Fashion Forum in Beijing on March 29, bringing sustainable ideas to the world’s largest garment manufacturing and exporting industry. The forum is the major event in China’s garment industry, with roughly 500 attendees, mostly fashion designers and business leaders. As the fashion industry ranks only behind the oil and gas industry in terms of carbon and pollution emitted, it was a perfect place to convey the importance of sustainability in both brand management and the future of the industry. The Chinese leadership recognizes the urgency of environmental protection and has incorporated “green development” in the latest 13th Five Year Plan, the government’s guiding development targets. Nonetheless, it takes more than government directives to achieve ambitious emission reduction goals. The private sector and business associations have to play an integral role. “It costs 20,000 liters of water to produce one kilogram of cotton, which is just enough to produce a pair of jeans,” observed Guo—a stark measure of the importance of incorporating sustainability into fashion enterprises. 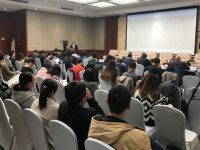 Guo’s speech explored the intersection of sustainability and fashion, and the lessons for Chinese apparel manufacturers and major brand executives. The key message was that within the fashion industry, sustainability pursuits can incentivize innovation, motivate employees, attract consumers and increase the overall competitiveness of the fashion business. Although conventional measures of a corporation’s success center on things like profit, product and branding, the future of business development hinges upon the sustainable capacity of an enterprise. Companies increasingly recognize the demand from consumers to be more environmentally friendly and socially responsible, and they are responding to that by changing traditional business practices and even corporate culture in order to retain and expand their customer base. The idea of eco-fashion has been championed by clothing companies like Patagonia and Esprit for decades. These leaders in sustainable fashion illustrate the benefits of socially responsible product design and lower-impact manufacturing. To achieve sustainability in the fashion industry, compliance to the strictest regulations, value chain sustainability, environmentally friendly design and service, and innovative business models are the four major steps. Compliance to the strictest rules will motivate manufacturers to experiment with new materials and production methods, devise state-of-the-art corporate bylaws, and prepare the corporation for involvement in the law-making processes. Value chain sustainability is the second key component. Through life-cycle analyses, businesses can itemize their environmental inputs and outputs. From energy consumption to raw material supply, fashion businesses can become more sustainable by providing incentives or guidelines to their suppliers, manufacturers and employees. A good example is the popular clothing company H&M, which has pledged to use 100 percent organic or recycled cotton by 2020. At Levi Strauss & Co., the company’s “terms of engagement” with its employees showcases how sustainability increases employees’ recognition of the employer, which is especially important to younger consumers. Sustainable products and services are also increasingly appealing to consumers, a growing trend since the 2008 financial crisis. Products with unique design and added value, such as Nike’s apparel eco index, Levi’s durable jeans and Puma’s smart shoebox not only refresh corporate images but also speak to the consumer ethos of today. 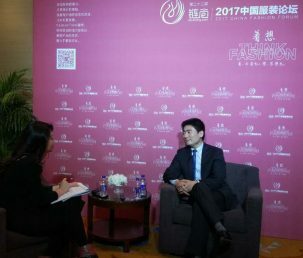 Dong Guo talks to Chinese media during the annual China Fashion Forum in Beijing on March 29. With these sustainability steps come new business models. The process occurs within the constraints of regulation, business interests, and consumer preference. 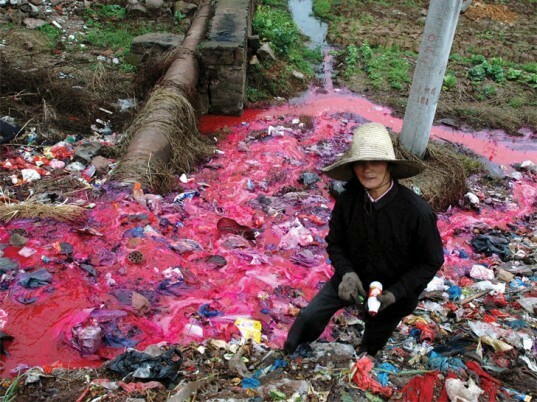 To realize this sustainability-driven innovation in China, there is still a long way to go. Most Chinese brands are yet to establish a recognizable image. 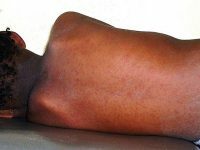 Their supply chain companies still demand more training to comply with basic safety standards. Moreover, we need to better understand what matters to Chinese consumers in order to foster their sustainable taste. Guo said sustainability-driven innovation should be at the core of the fashion enterprise. Just as “global business” evolved from being a separate department in a corporation to an integral part of any enterprise, sustainability and its impact on corporate management shall chart its course of expansion as well. Mingyuan Song is the China program officer for the Research Program on Sustainability Policy and Management.